This article is sponsored content brought to you by Parnell. Over the last fifty years Parnell has become a leading global veterinary pharmaceutical business marketing products in 14 countries. We have built a fully integrated animal health platform and offer unique digital technology platforms that integrate with our innovative products to offer veterinarians and animal owners superior solutions to their animal health needs.We currently market novel cattle breeding programs as well as osteoarthritis solutions for dogs. Parnell is committed to continued development of innovative products at the highest standard. Our value-added approach establishes us as a business partner with our customers, not a commodity provider. That is the Parnell difference. Restore your dog’s youthful mobility with Zydax. 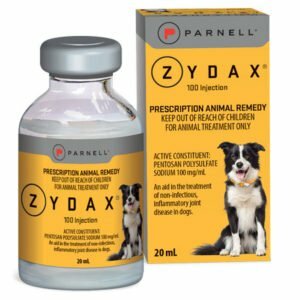 Zydax is an injectable medication that helps recapture the youthful mobility of dogs with OA. Zydax is a true Disease Modifying Osteoarthritis Drug that targets 2 key signs of OA: cartilage degeneration and inflammation. Zydax has been shown to protect proteoglycan levels in cartilage and inhibit ADAMTS4. Safe to use with NSAIDs. Zydax can be used safely after surgery, upon discharge. After giving dogs a jump on relieving of the signs of OA with Zydax, we recommend Glyde as a dual joint care treatment for OA. Support your dogs’ youthful mobility with Glyde. 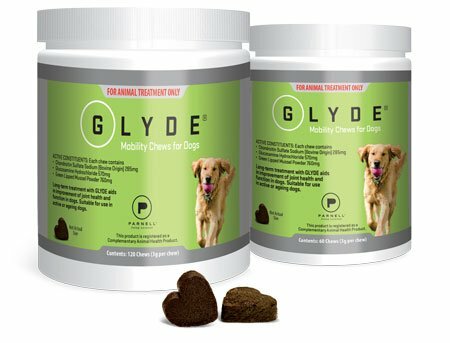 Glyde Chews and Powder is a proven alternative that not only controls the clinical signs of osteoarthritis, but also aids in the improvement of joint health and function in dogs. All-natural environmentally sustainable ingredients proven to relieve the painful signs of osteoarthritis; New Zealand Green Lipped Mussel (GLM), Glucosamine and Chondroitin. Vet Only APVMA registered nutraceutical. Glyde can be taken daily long term to help control the clinical signs of OA between courses of Zydax.